Once upon a time is how many adventures begins. This one starts now (or well it started Tuesday after many preparations). Day Zero. Time is reset as I leave Danish airspace destination Nomadic life, first stop Bangkok. The flights are turbulent. First one to Amsterdam is physically turbulent as we pass through a major rain storm. Second one from ‘Dam to Bangkok is emotionally turbulent. This is huge. Hours earlier I said goodbye to my two best friends. Now raw electricity shoots through my veins. Goose bumps. Heart races. Into the Wild, the wild unknown. Leave it all behind. New life. Reset time. Immigration and luggage is a breeze and I find my good friend Kai – he worked with us on the Malaysia and Borneo expedition in June. We get a taxi to his suburb Ramkanphaeng. Part of the fun and challenge of travel is knowing nothing. This is at the extreme end of that scale! 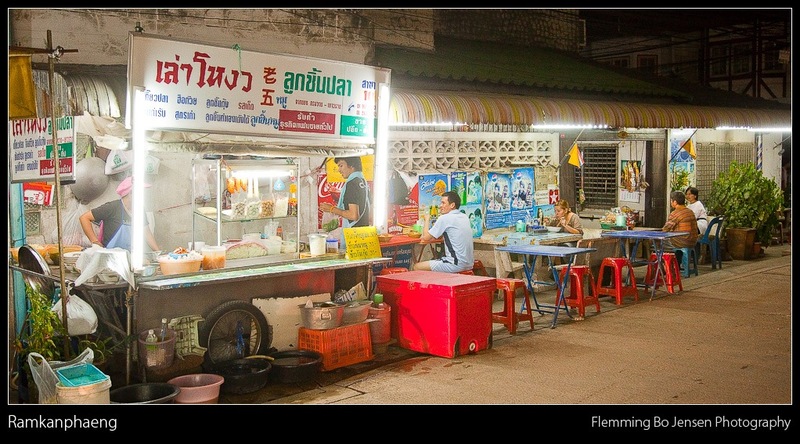 Ramkanphaeng is a large uni suburb, mostly students or people who work at the uni. Kai speaks very good English but no one else does and everything is written in Thai. For 3 days I do not meet any other tourists. Not a single whitefella actually. I cannot read and only Kai understands me. I eat at the street kitchens where I point to food and handover money not understanding the price (does not matter anyway is lunch is something like 30 bath = 1 US dollar). This is actual true Bangkok life, no touristy Khao San Road from hell and it is incredible fascinating to experience this. More Ramkanphaeng stories to come, here are a few snapshots from the streets and markets. Main road of Ramkanphaeng, add some rain and this is Blade Runner! Very busy street, even more so at night. A typical street kitchen on the small road where I stayed. This is away from the main road and a charming neighbourhood of real life. My Hood – kitchens and shots on the street where I stayed. As I am ordering lunch from a street kitchen using my special pointing technique a guy asks me in English “oh you know and like Thai food”. “Yes”, I say surprised, “Love it”. Turns out he is from the Philippines and when I reveal I am Danish he promptly speaks to me in Danish. He used to have a Danish girlfriend. Small world at times or weird coincidences surely! 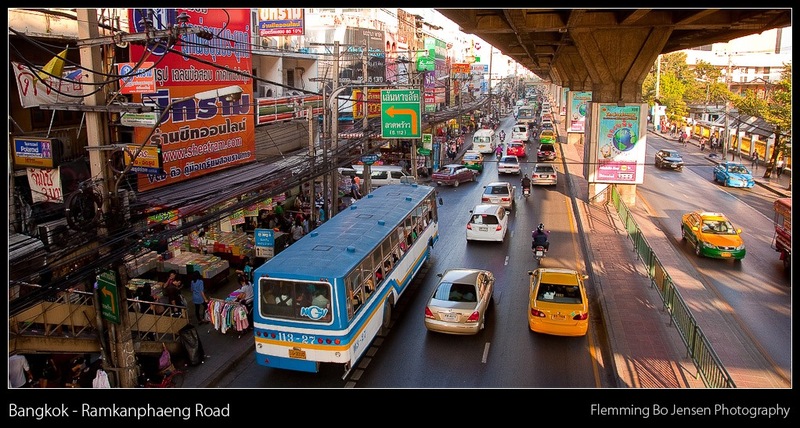 I did spend a few hours in the city centre and saw Khao San Road which is hell on Earth. A disgusting terrible tourist trap backpackers from hell street of nothing but pubs, restaurants and shops pushing crap to tourists. Interesting to see, a completely different world to Ramkanphaeng. Naturally as time is being reset some weird glitches occurs in the ‘Matrix’. In ‘Dam airport a young Brit two meters from me is arrested by the Police and he then promptly proceeds to regurgitate the drugs he is smuggling. On the plane to Bangkok I actually sit next to a couple from Finland named the Harkonens! (read Frank Herbert’s Dune). Nomad. Photographer. Traveler. Wanderer. Dreams become reality. Nomad. Basically means either a pastoral nomad, moving his herd every day in search of food, or a hunter gatherer nomad moving with the wildlife. Bruce Chatwin was forever fascinated by nomadic life and once spent years and years writing a book about his own thesis on ‘the nomadic alternative’. This brick of a book was according to his publisher almost unreadable and Chatwin ended up instead traveling Patagonia and writing ‘In Patagonia’. The rest is history. I have spent the past 4 months attempting to realise my own Nomadic Alternative. On Monday the 23rd of November dreams become reality as I board my plane to freely travel the world, photograph, experience, write and live! New life. The road is the home. Nomadic Alternative. I now own basically what I can carry. Well, carry with some help as there is an awful lot of camera gear, laptop, books and clothes. Still, my life and possessions is reduced to a mobile state and I have no home but the world, the road. Nomadic alternative. These are truly exciting times! Complete freedom and total liberation! I do know how lucky people consider me to be and I will live up to it. But I have basically created this situation myself and I believe everyone can do this or parts of this. Most of what tie us down are in our minds! While I do call it my Nomadic Alternative, like Bruce Chatwin would say, that is a truth and a half. Chatwin liked to say he was travelling with just a notebook and a backpack. In reality he carried a whole home with him, including a ton of books. In reality I will be jumping from base to base as a place to sleep is always quite nice! My first base will be with friends in Chiang Mai in Northern Thailand. A dear friend from Copenhagen will also join me in Chiang Mai and together we will explore Asia for the next 4 months. Thailand, Malaysia, Borneo, perhaps Burma, Laos and a little gday to Australia as well could be on the menu. No plans, except to live! photograph, experience, travel and be free, free! Let us conclude with the road, in this case a lovely red dirt road from Karijini, Australia. Red and blue dawn at it’s finest. Into the Wild. 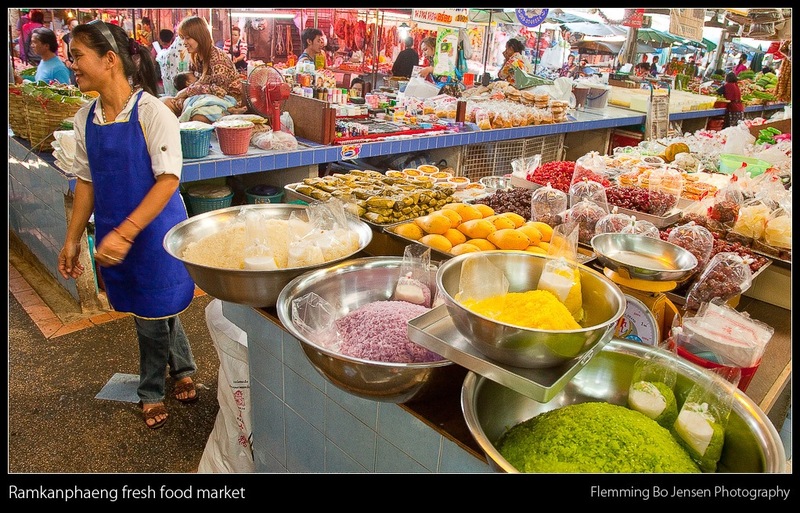 If you know some great photography locations in Thailand – and Asia – I would love to hear about them! See you on the road. New “real” blog post coming soon, stay tuned. Apologies for not blogging much lately, battling fatigue, a cold and a headache after pushing myself a bit too much changing my life completely. So I will let a lovely African image speak for itself today. Gorgeous Springboks in front of a huge wall of sand at Namib Naukluft National Park in Namibia. Springboks and antelopes are an absolute joy to watch as they playfully run and jump around the plains of Namibia simply toying with gravity. This image originally had another crop where a sliver of sky was visible. Turned out on second thought that this actually hurt the image, it is much more open and expansive with just the wall of sand and no sky visible. This way there are no borders to the sand. The art of cropping, possibly the most dramatic improvement you can do to your images is a perfect crop in my opinion. The art of cropping – will be the subject of a longer article sometime soon.